I parked my car on a lonely road surrounded by clouds and high mountains which I felt were really nailed to the earth otherwise everything would have been floating in the air. There were a few tea stalls but they were closed. I made my way to a building with a cross on top. I entered the small red and grey building. The structure was made of stones and seemed to have been constructed during the British rule. The building was abandoned surrounded by waist high shrubs, huge rocks and wild plantation. Suddenly, a man came running towards me. I wondered from where he had spotted me. He informed me that the building was an abandoned church. I was saddened to see the place in shambles (for a moment I even imagined that the building was haunted). I sneaked in through the broken glass door. Inside I saw benches, a few candle stands and rostrum for the priest, all in ruins. It was a sad sight. I came across ruined church on my way to the most beautiful place in Pakistan, Thandiani. After taking pictures of the derilct building, I resumed my journey to the top of Thandinani but the images of the church still lingered in my mind..
Thandiani is a popular tourist spot. Not many people are familiar with its historic significance. Thandiani in the local language means ‘very cold’ and so it is! The mountain peaks were covered with clouds in beautiful symmetry, evoking a romantic atmosphere. Thandiani is a hill station in the Galliyat area of Khyber Pakhtunkhwa in Pakistan. I must commend the KPK Government for constructing such an amazing and a smooth road to this hill station. A huge improvement since my last visit. While travelling on this road you will come across instructions about the wild animals and how to deal with them, if you follow thoee you will be safe, but do not let your kids hang out of the car windows! 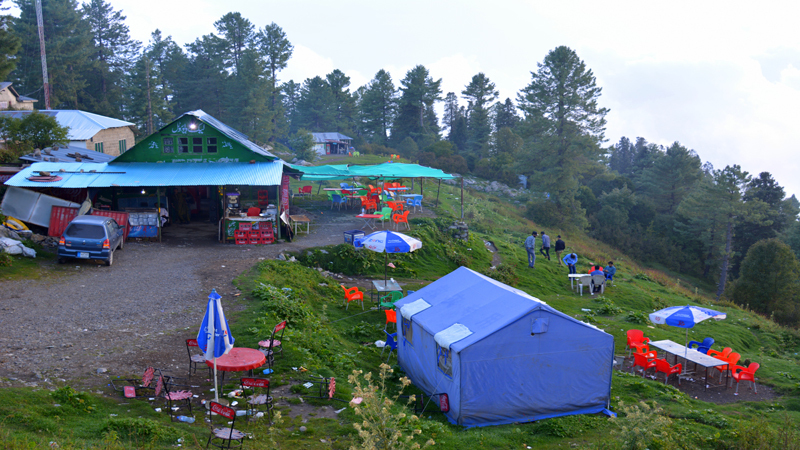 Thandiani is located in the northeast of Abbottabad District and is about 37.5 kilometers from Abbottabad in the foothills of the Himalayas. On this route you will see the Pir Panjal mountain range of Kashmir, the mountains of Kohistan and Kaghan and the snowy ranges of Swat and Chitral. It is 45 to 60 mins drive from Abbottabad. To my surprise the hills of Thandiani are about 2,750 metres (9,020 ft) above sea level. There were two to three tea stalls or maybe you can call them small restaurants for the tourists but there are not enough tourist facilities. Would you believe that there is no water and thus no washrooms! Well to me that was something unpleasant because there were so many tourists at that spot with families and infants. Now let me tell you historic importance of this place. It is said that Thandiani was originally granted as a lease to some members of the Battye family in British India, who were missionaries and members of the British civil and military service. This family produced scions such as Wigram Battye and Quintin Battye. The Battyes subsequently gifted the location to the church authorities, where a sanatorium and various other facilities were set up during the British rule, mostly for the convenience of missionaries, Anglican Church personnel and officers stationed at the neighboring cantonment of Abbottabad. It also contained some private European houses, a camping ground, a small bazaar, and the small seasonal church of St. Xavier in the Wilderness which were occupied only during the summer months. So with this history of the area, the existence of the abandoned church made sense to me. But I wondered what happened to the other buildings which the British had constructed during their stay at Thandiani. I could not see anything except for that one church, a few restaurants and tea stalls. In my opinion the government of KPK must take up this site and develop it into a tourist spot like Murree. The government has already achieved the most difficult step which was the construction of the road. Now the remaining work is easy. After all, this site properly restored could be turned into an interesting tourist spot. There should be handicrafts and souvenir shops built there, and most importantly, a tourism information center should be established with the facility of tourist guides and hiking experts. Yes, the hiking track should also be maintained and the Forest Department Rest House should also be promoted so that the people can go and stay there. More hotels, resorts and guest houses should be made there so that people can divert to this place from Murree and Nathia Gali, as now these two spots are over flowing with tourists and people are in search for more hilly spots with nice weather and good resorts. Being at a high altitude, with attractive scenery and several hiking trails into the forests and other nearby locations, it is a very attractive prospect. The absence of electricity and water supply has not allowed this place to get overdeveloped like Murree, Nathiagali and Ayubia. Thandiani weather is excellent which the tourists admire. It is a lush green during the summers and covered with snow during the winters. Both the seasons give completely different views of the same place. I love this place as every time I visit it I find it different and more attractive. I have seen tourists from all over Pakistan and especially the foreigners enjoying the beautiful vista and the galore of nature. One cannot live without thanking the Almighty Allah for blessing us with all such beauty and that too in abundance. 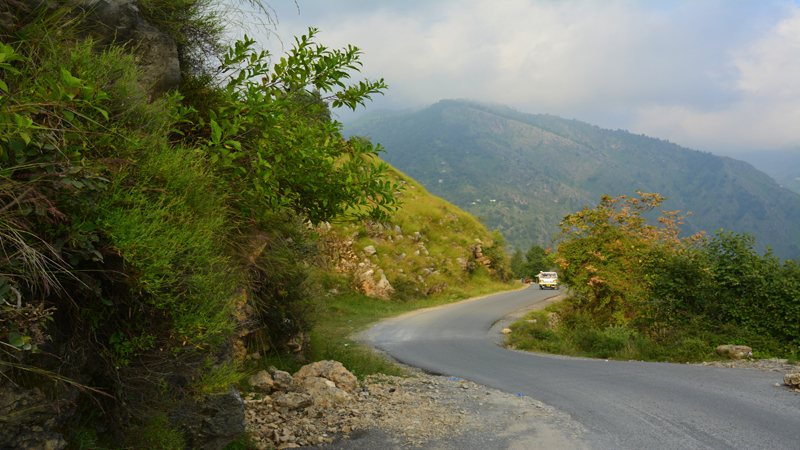 A beautiful trek leads to Thandiani from Abbottabad that passes through Dagri Naka. The most amazing thing is that the mountains around Thandiani are quite thickly forested compared to most other hill stations in the locality. There is a variety of local wildlife in this area and it can also be utilised if there is a safari ride built somehow there. To name a few there are leopards, monkeys, several kinds of pheasants and the increasingly rare flying squirrel and pine marten. The sunset is amazing and mind blowing and I suggest that you all should experience it once in a lifetime. Let me tell you another thing about this place. This area was also affected during the 2005 earthquake but fortunately now it has recovered from the devastation. There are beautiful trees on the way to Thandiani and also a few small caves which are probably home for the local wildlife. This place has all the potential to develop as a good base for ecotourism activities. This can be money minting tourist spot for the Government and can help in the economic uplift of the people living there.